From now on, CaFlyers.ca will serve you with its new theme and features ! 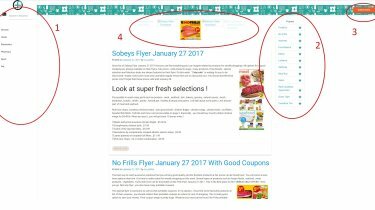 With its new theme, CaFlyers.ca now more capable, flexible and easy to use. Now lets check out the best features and new skills of our new theme ! With this feature, you can have more flexibility to search any retailers and now this task is easier than ever. Now lets focus on the right side of our main page named section “2”. In it, you can see the popular retailers in one place. With this feature, you can see and browse the best retailers and flyers with just one click. In section “3” you will see the “SUBSCRIBE” button and with it you can subscribe our news teller for daily deal alerts and brand new flyers. In section “4”, you will see our new flyer carousel and with it, you can easily see and select the newest flyers. We also changed our flyer view screen with more easy to use and eye friendly version, so feel free to check it out too ! And please give us feedback for creating more user friendly environment, just for you and your needs. You can mail us for feedbacks and subscribe our news teller for more news and improvements. Your Best Source To Find Local Retailers', Newest Flyers And Hottest Deals. CaFlyer.ca is Simple and Very Easy for Daily Use.